It’s all over minus the hangover. 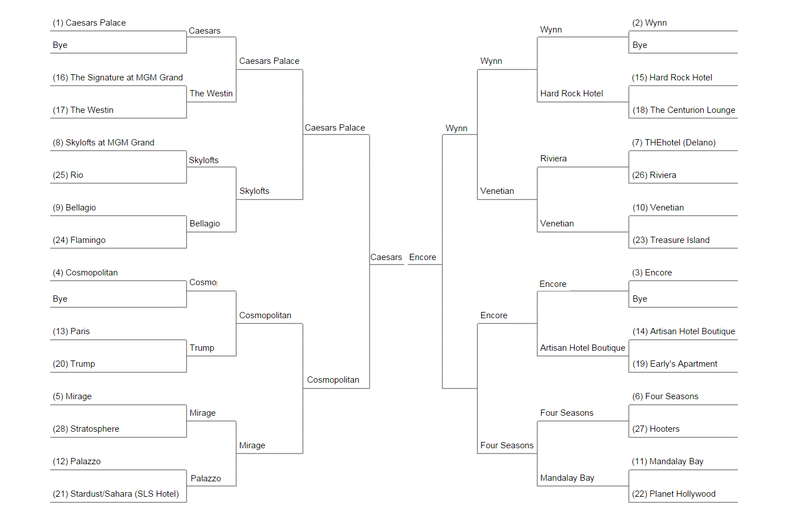 Six weeks ago, I began the Knockout Tourney: The Winner’s Bracket of Where to Stay in Las Vegas. And much like a trip to Las Vegas, I’m oh so glad that the journey is over and I can back to my normal day-to-day routine. The hangover of having to write one Hotel Review after another on Sin City was worth the effort as readers will not only have a guide of where to stay in Vegas but also a timeline documenting the transformation of this iconic American city. Unlike many bloggers that issue the same review e.g., the check-in process was very smooth, I liked the soft toilet paper, I tried to give unique insight on each property useful for someone looking for a great time in Vegas. 28 hotels were more or less reviewed and in the end, unlike March Madness, the overall number one seed, Caesar’s Palace, carried the day. So for one last time, I’m posting the recap of the entire tournament with the perfect bracket for all to see.